'Monty Python and the Holy Grail: 35th Anniversary Edition' Dated for Blu-ray! The classic 1975 British comedy will be banging coconuts together in high-definition this March! 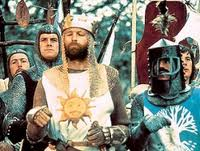 According to Wal-Mart.com, Sony looks to be releasing 'Monty Python and the Holy Grail: 35th Anniversary Edition' on Blu-ray on March 20. Specs and supplements have yet to be revealed, but suggested list price for the Blu-ray is set at $19.99. You can find the latest specs for 'Monty Python and the Holy Grail: 35th Anniversary Edition' linked from our Blu-ray Release Schedule, where it's indexed under March 20.